Most manufactures these days try to lure customers with pretty coloured PCB, and flashy cooling gear. When we received the PixelView GeForce4 Ti4200-8X we were a little disappointed with the massive extruded heatsink which floats uselessly over the memory DRAM's. The saving grace is that while the GPU/memory heatsink may have been a bit oversized than really necessary, Prolink have taken to differentiating their GeForce4 in another more important way. With the Ti4200-8X, Prolink are targeting the mainstream gamer who doesn't need the "extras", just solid performance. While there is a solder mask for a DVI port, the card we tested came with just an analog VGA connector. This means that gamers with LCD monitors supporting just the DVI standard are plane out of luck. Thanks to the Phillips 7104E chipset, the PixelView features an S-Video output which can come in quite handy. The card comes with an S-Video to composite cable, and a S-Video to S-Video cable. In terms of software, the bundle came bearing WinDVD and two full version games; Ballistics and Codename: Outbreak. 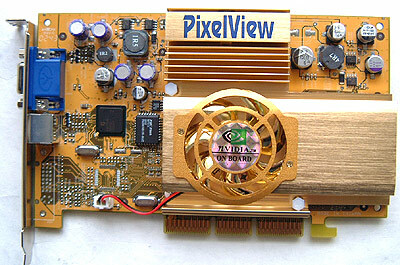 The PixelView Ti4200-8X sports 64 MB of memory, courtesy of 3.3ns EtronTech DRAM. Thanks to that 3.3ns rating, Prolink are able to overclock the card's memory to 566MHz by default. Even though the videocard has a rather large GPU heatsink, Prolink only clock the Ti4200 core at 250 MHz. In terms of overclocking, the memory was quite up to the challenge and maxed out at a rather impressive 658 MHz. The core was not to be out done, and reached 313 MHz by the time we were done with it.